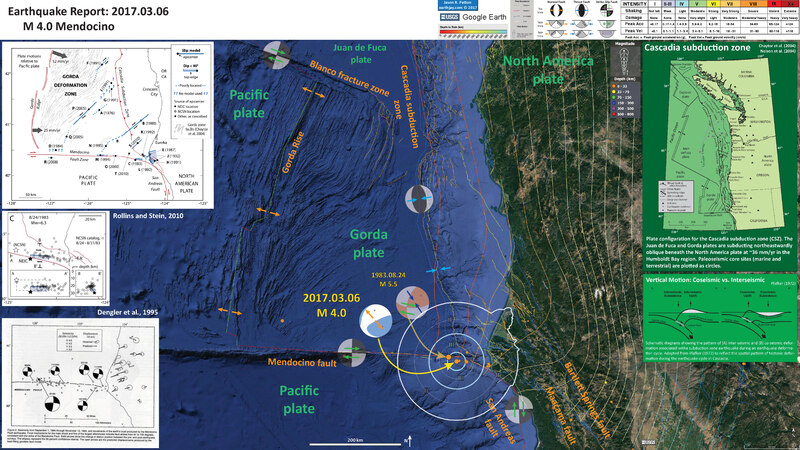 We just had an interesting earthquake in the region of the Mendocino triple junction. Recent earthquakes in this region show different fault plane solutions, owing to complexity of this area. In 1983 there was an earthquake ~10 km to the west of today’s earthquake which had a right-lateral oblique compressional focal mechanism. In 2015, there was an earthquake ~15 km to the east of today’s earthquake that also had a right-lateral strike-slip moment tensor. If today’s earthquake was oblique, it would be left-lateral extensional. Today’s earthquake is quite interesting. I will need to think about it further. Here are some USGS websites for earthquakes discussed below. Here are some Earthquake Reports for earthquakes discussed below. I placed a moment tensor / focal mechanism legend on the poster. There is more material from the USGS web sites about moment tensors and focal mechanisms (the beach ball symbols). Both moment tensors and focal mechanisms are solutions to seismologic data that reveal two possible interpretations for fault orientation and sense of motion. One must use other information, like the regional tectonics, to interpret which of the two possibilities is more likely. The moment tensor shows northwest-southeast compression. This is very strange. I initially thought it was a compressional earthquake (slightly oblique), but now interpret this as an extensional earthquake. I am struggling to explain this. In the upper left corner is a figure from Rollins and Stein (2010). In their paper they discuss how static coulomb stress changes from earthquakes may impart (or remove) stress from adjacent crust/faults. 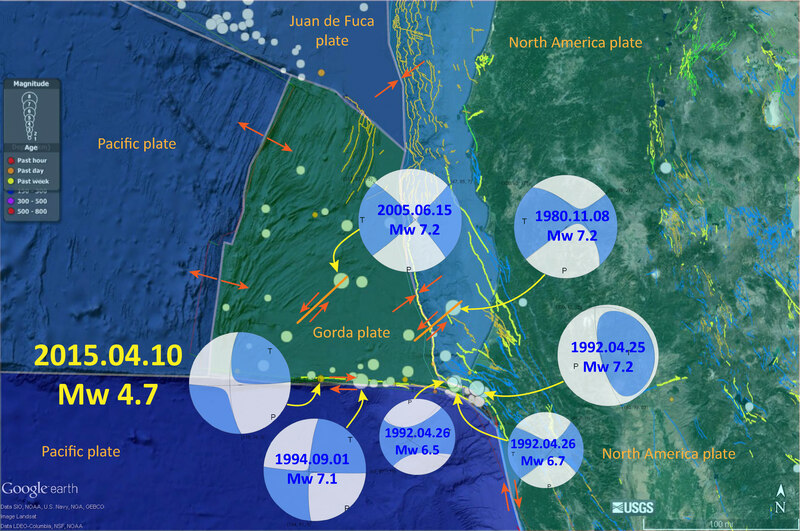 I also present their figure where they present seismic observations for the 1983.08.24 M 5.5 earthquake (Rollins and Stein list M 6.3). Here is a large scale map of the 1983 earthquake. The mainshock epicenter is a black star and epicenters are denoted as white circles. 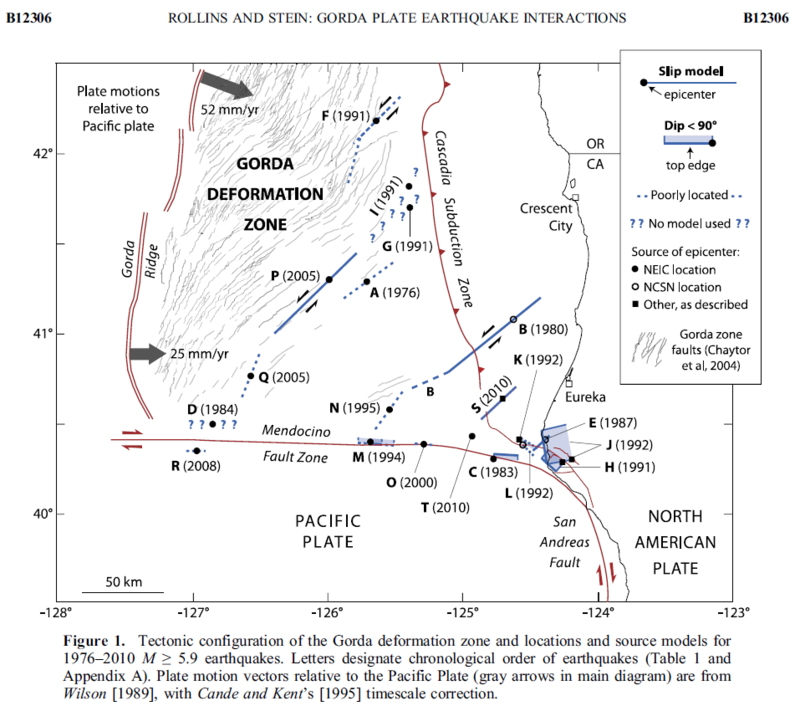 This earthquake is interpreted to be strike slip oblique (compression). Source models for earthquakes A and B, 26 November 1976, Mw = 6.7, and 8 November 1980, Mw = 7.3; C, 24 August 1983, Mw = 6.1 (poorly constrained); D, 10 September 1984, Mw = 6.6 (no model made); E, 31 July 1987, Mw = 6.0, “WS2008” refers to Waldhauser and Schaff ’s  double‐difference catalog; F, 13 July 1991, Mw = 6.8 (poorly constrained); G, 16 August 1991 (2226 UTC), Mw = 6.3 (no model made), open circles are NCSN locations for 16 August 1991 (2226 UTC) to 17 August 1991 (2216 UTC); H, 17 August 1991 (1929 UTC),Mw = 6.1; I, 17 August 1991 (2217 UTC), Mw = 7.1 (no model made); J, 25 April 1992, Mw = 6.9, open circles are from Waldhauser and Schaff ’s  earthquake locations for 25 April 1992 (1806 UTC) to 26 April 1992 (0741 UTC); K and L, 26 April 1992 (0741 UTC), Mw = 6.5 and 26 April 1992 (1118 UTC), Mw = 6.6 (both poorly constrained), seismicity shallower than 15 km was excluded so that shallow aftershocks of (J) do not crowd figure; M, 1 September 1994, Mw = 7.0; N and O, 19 February 1995, Mw = 6.6, and 16 March 2000, Mw = 5.9; P, Q, and R, 15 June 2005, Mw = 7.2, 17 June 2005, Mw = 6.6 (poorly constrained), and 28 November 2008, Mw = 5.9 (poorly constrained); S and T, 10 January 2010, M = 6.5, and 4 February 2010, Mw = 5.9; Z, 18 April 1906, M = 7.8. Here is a primer that helps people learn how to interpret focal mechanisms and moment tensors. Moment tensors are calculated differently from focal mechanisms, but the interpretation of their graphical solution is similar. This is from the USGS.